Hundreds of thousands of skiers and snowboarders could see congested down-mountain commutes eased next winter with legislation meant to nudge transportation officials toward a new-to-Colorado technology. Movable concrete barriers would divide a section of westbound Interstate 70 on weekend afternoons, temporarily rededicating the inside lane to eastbound traffic along one of the roadway’s most snarled segments. The lawmakers pushing the plan estimate that the extra eastbound lane could halve drive times over the affected stretch, though others worry about the safety and feasibility of using the system on steep, wintry roads. The bill authorizing the movable barriers and another bill to restrict truckers to right-hand lanes are stopgaps that aim to ease pressure on I-70 while Front Range and mountain communities wait for more permanent fixes that are at least a decade away. “This is not a permanent, long-term solution, but this is a huge down payment to help average citizens get back and forth from the mountains we love,” said Sen. Chris Romer, one of the sponsors of the barrier bill. Romer, D-Denver, and Sen. Dan Gibbs, D-Silverthorne, introduced the legislation Monday. The Colorado Department of Transportation has been considering the movable barriers – sometimes called “zipper lanes” – for about a year and is in the process of studying safety issues, a spokeswoman said. One scenario envisioned by the senators would put a zipper lane down a 15-mile stretch of I-70 through Clear Creek County. Transportation officials are considering a longer area but have yet to develop a detailed plan. For three or four hours on Saturdays and Sundays, the chain of linked concrete barriers would be moved to between the westbound lanes to create an eastbound express lane from just before Georgetown to Central City Parkway. Just one company in the country provides this type of service. Vacaville, Calif.-based Barrier Systems operates in a number of states and in New Zealand and Mexico, where its specially designed barrier-moving trucks can do their work at a speed of 10 mph. Utah’s transportation department uses the technology to compensate for lost lanes during road construction, said spokesman Nile Easton. A more permanent zipper-lane project in Massachusetts costs $1.2 million annually to operate twice a day, five days a week along a 6-mile stretch of Boston’s Southeast Expressway. Barrier Systems president Chris Sanders estimated the annual cost to Colorado would be much less and that upfront costs would range from $20 million to $40 million. Under the Romer-Gibbs proposal, Barrier Systems or another bidder could pay to establish the system and lease it back to the state. Under the transportation department’s plan, the state would likely buy the system outright. 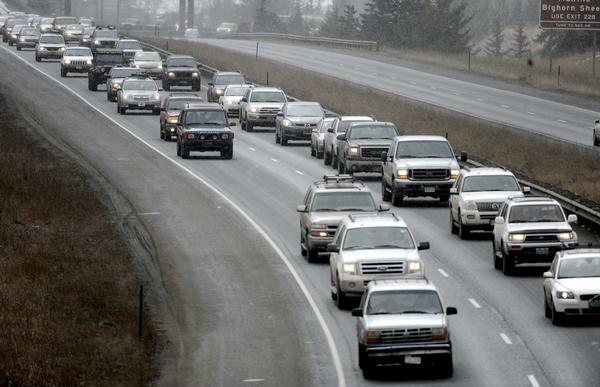 The zipper lanes are not without potential problems, said Harry Dale, Clear Creek County commissioner and board member of the I-70 Coalition, which is working on transportation improvements in the corridor. While generally supportive of the concept, Dale said he worries about vehicles breaking down or snow piling up in the hard-to-reach temporary eastbound lane. He said he wants to see the results of the transportation department’s feasibility study. Still, he said, it is likely to be 10 years before a more permanent fix – a monorail, bus system or road widening – can resolve the I-70 bottleneck. The zipper-lane bill marks collaboration by two lawmakers who butted heads two years ago when Romer proposed tolling portions of I-70 and Gibbs vehemently fought the plan. Gibbs said the new plan can help break the bottleneck without affecting long-term road-construction plans.